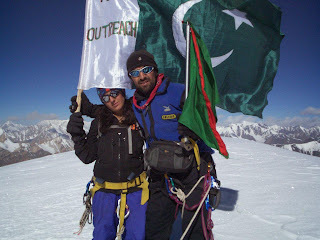 Karakorum this year remained very fortunate to me and to my team, i have been very blessed to have the great news shared that, our Expedition, A Quest Beyond Limits Part I named by Pakistan Youth Outreach and (shimshali People 2010) by Satwa Guna Project. Before going in to further details, would definitely want to give a precise introductin of the Program being carried out, Pakistan Youth Outreach." 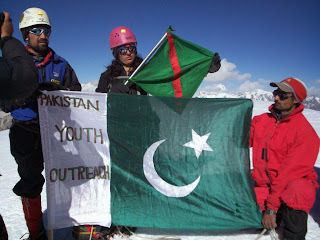 A youth Mountaineering Education,awareness and women adventure promotion program"
the them of the program is to entertain and introduce real mountain adventure in the country and encourage and give awareness to the youths and women. 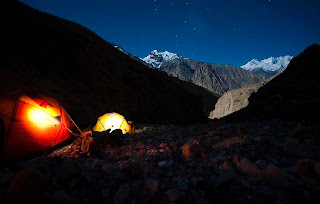 the adventure activities have been kept in more dark and have not been planned anything very proper and for real, in this regard, we have planned to make a special arrangement and projects to make adventure sports more common and more public.after all Pakistan has the largest Adventure potential area in the world and the most challenging peaks ,passes and beautiful valleys,. 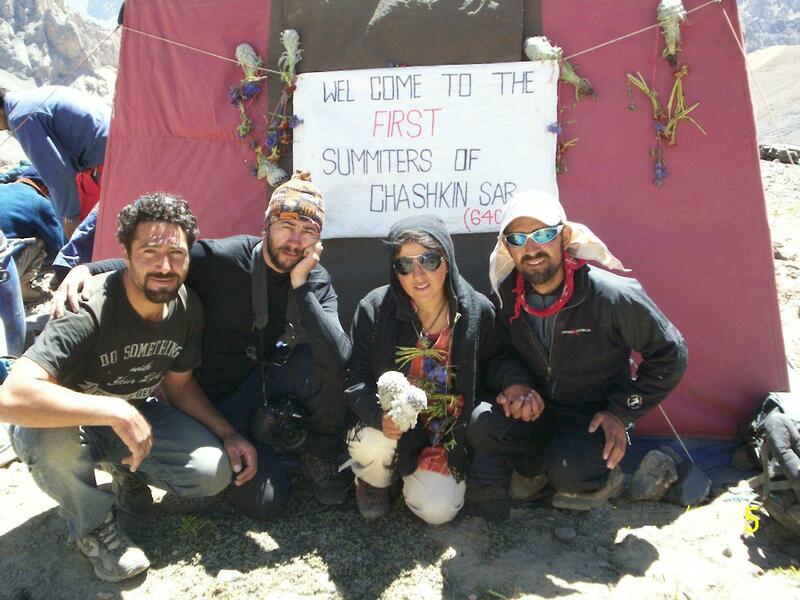 the Project was the first project of its type in the country, to organize women expedition to any unclimbed peak, the peak which we chooses to climbed was (chashkin Sar 6400m). in the karakorum Maidur area. this project was a joint Venture of Pakistan Youth outreach and Satwa Guna project. 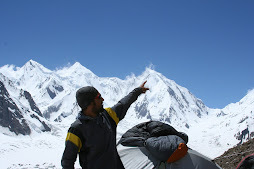 our expedition start from 22 of August and last till 8th of September, how ever the project had 45days in total but unfortunately due to some documentation issue with EP Wing Islamabad.,we spent two weeks in Islamabad. the project had to make a documentary about shimshali life and mountain life, it was also planned to make social,culture part of the village, being a Muslim and village how a girl manages to climb a peak, however due to shortage of time, the entire film was not made as it was designed! the expedition started on 26th of August from shimshal and after three days, reached base camp,which we named Samina Camp, the next day, we were on Acclimatization to high camp, the next day, we went to high camp ,the night was so fine, the weather was perfect and pleasant, could see the stars shining up in the sky and the same had wonderful MOON! we start from high camp at 3:35am Local time, and having nice weather ,the peak was more icy and tough, no snow , the first part was quite difficult ,how ever samina managed very well and climbed gracefully the first and icy part, then later the steep part was nice, lead by Mirza Ali,(group leader) . 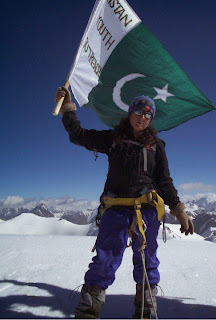 after a six hours long climb finally we reached to the top, it was indeed wonderful view all around ,thausands of mountains we could see around and it was indeed wonderful that first Pakistani girl reached the highest point where no other girls could reached. on the summit we made lots of photograhy and video. the team was so happy over the s succesful climb. 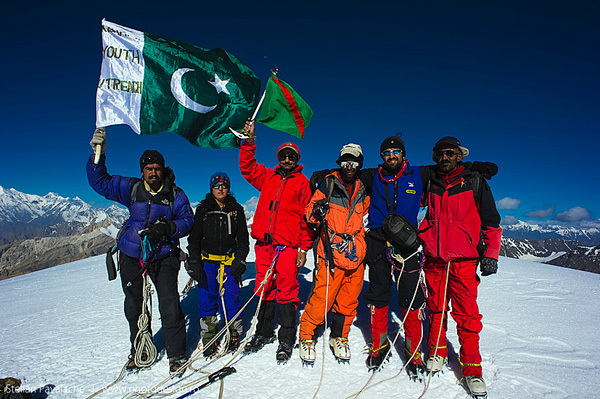 the team reached at hgh camp on the lower sloops of the peak after meting of snow was very hard to climbing down, it took time to get through the snow part. samina without proper training did very WELL ,and reached hgih camp after ,lunch ,closed and packed our equipment ,tents and rushed to Base camp .the base camp, in the after noon, Wazir and Imran our cooks ,showed a wonderful warm welcome, with flowers and a nice banner ,written,(welcome to the first summiters of Chashkin Sar 6400m) it was a nice and nice welcome, i was truly moved by his great gesture and welcome. he served us with wonderful meal and soup, it was unforgeable movement i experienced. in the night we had a nice singing and dancing party, lots of dancing and singing from all the members!